This site provides an introduction to the history and trends of health and science research policy in the United States since World War II. Two narratives have dominated health and science research: (1) growth in funding, scale and complexity; and (2) the special ethical issues that arise when human beings are the objects of study in research. Epochs and events regarding funding and scale are in the left column below; protecting human beings involved in research along the right column. 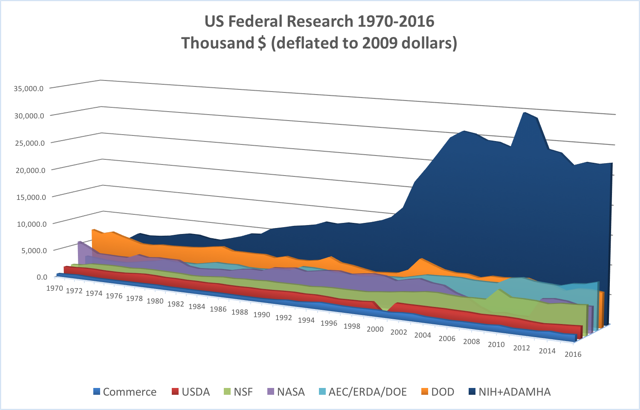 The graph below represents the changes in federal funding for health research and development from the second half of the 20th century through the present. As outlined below, the two narratives have run concurrently since the late 1940s. This site is written and prepared by Robert Cook-Deegan, a Professor at the School for the Future of Innovation in Society and Consortium for Science, Policy and Outcomes at Arizona State University. Research and writing support was provided by Rachel Zacharias, a recent graduate of Duke University and a current Project Manager and Research Assistant at The Hastings Center. Research for this project was funded by the Robert Wood Johnson Foundation (through its Health Policy Investigator Awards) and the Duke University Institute for Genome Sciences & Policy. Note: We are continuing to add resources and texts to this site. Pages denoted with an asterisks (*) will be added soon. Before World War II, health research was primarily funded by industry, philanthropies and other private sources. The distinct impact of healthcare and science in World War II inspired a heightened government involvement in health research funding, led by the National Institutes of Health. Since the 1950s, health research funding can be roughly categorized into 5 eras, distinguished by the state of science, funding trends and priorities of the nation at the time. The following documents provide an overview of US health research funding over time, with specific instances further discussed in the timeline below. Before World War II, the protection of human beings involved in scientific research was not considered at length in the United States. Amidst the aftermath of World War II, the Nuremberg Trials exposed the horrors of research conducted on humans in Nazi Germany, and shed light on the state of research and health care conducted in the US and worldwide. (The American Eugenics movement, for example, met major opposition after comparisons were made with Nazi studies.) The Nuremberg Code inaugurated a systematic effort to protect the autonomy, dignity and rights of humans involved in research. These efforts and the individuals tasked with maintaining them have evolved as the state of science has introduced new ethical and technical concerns. An overview of human subjects protection is included here, and the major trends throughout the decades are outlined in the timeline below. Pharmaceutical houses, private philanthropy, and individual hospitals and medical facilities support most health research. 1942: Congress appropriates $700,000 to the National Institute of Health. Transition from private funding to public funding by rapid growth of NIH appropriations. Second half of the 1950s: Federal research appropriations. 1960s: Appropriations continue to increase substantially (mild interruption in 1964). Concerns about ethics and safety of humans involved in science research triggered by international and domestic events. Rebuilding a coalition with new players and resumed growth through the War on Cancer and the rise of molecular biology. 1967-1969: Transient decline in appropriations, caused by the dismantling of a political coalition that had to be rebuilt. 1970s: President Nixon’s War on Cancer. 1970s: Recombinant DNA introduces policy into biomedical research arena. Mixed growth and stagnation of NIH funding, consistently faster growth of pharmaceutical research and development, birth and growth of the “new biotechnology” and emergence of the Human Genome Project. 1985: Human Genome Project emerges. 1990: HGP established in administrative units at NIH and U.S. Department of Energy. Mid-1990s: Several biotechnology firms (recombinant DNA and cell fusion) join ranks of pharmaceutical manufacturers, pursued research-intensive pathways to growth. 1996: Cloning of Dolly the Sheep. 1997: HGP spawns new NIH institute. 1998: Discovery of human embryonic stem cells; along with Dolly, both inject controversy into biomedical research. 1998: Celera Genomics created to “sequence the human genome,” in effect competing with the publicly funded international HGP. National attention given to bioethics and human subjects protections, the establishment of institutional review boards at publicly funded institutions and founding of a National Commission for Bioethics. 1970s: IRB approval becomes legally required for research that involves human participants in the United States or using federal funding abroad. Recombinant DNA introduces policy into biomedical research arena. 1973-1974: NIH and FDA are under threat of litigation, strongly prefer to implement their own regulations, rather than countenance an independent body to oversee research involving humans. 1974: National Commission for the Protection of Human Subjects of Biomedical and Behavioral Research, the nation’s first bioethics commission, created, started in part due to Eunice Kennedy Shriver’s outrage at research performed on fetuses in Sweden. 1985: Congress includes restrictions on fetal research in NIH authorization statute (removed during first two years of the Clinton Administration). 1995: Language prohibiting research that entailed the destruction of human embryos is included in NIH funding bills. Doubling of NIH’s budget through a concerted public advocacy campaign, alignment of interests, and bipartisan support, and the production of a reference sequence by the Human Genome Project. Late 1990s: Industry funded same fraction of health R&D that it did before WWII, but at a thousand-fold greater magnitude. Federal government dwarfs private philanthropies in “public” health R&D, but large private philanthropic funding agencies fill important gaps in chosen fields. 2001: In his first formal address as President, George W. Bush announces that federal agencies will not fund research involving human embryonic stem cell lines that had not already been created. Policy revision inspired by concerning internal reviews, gene therapy crises and NIH conflict of interest reports. 1998: Office of the Inspector General (OIG) Report alludes to an overburdened system “in jeopardy.” The OIG produces a series of reports on various aspects of human research protections*, including a 2000 report on whether the 1998 recommendations had been followed. 2003: Story breaks revealing NIH’s connections to private firms and other conflicts of interest. * Results in a policy cascade culminating in new federal regulations that took effect for NIH and other employees of the Department of Health and Human Services. Financial collapse, federal deficit and a shift in national priorities toward military and counterterrorism efforts create unaccustomed political turbulence for biomedical research. Flat NIH budgets, debates over stem cell research and mounting pressure for translating research into health goods and services. 2004: Stem cell restrictions and other biomedical research issues become divisive / partisan issue in the Presidential election. 2010: Congress appropriates $31 billion to the NIH: 28 major units; 19 institutes; 7 centers; National Library of Medicine and Director’s Office.